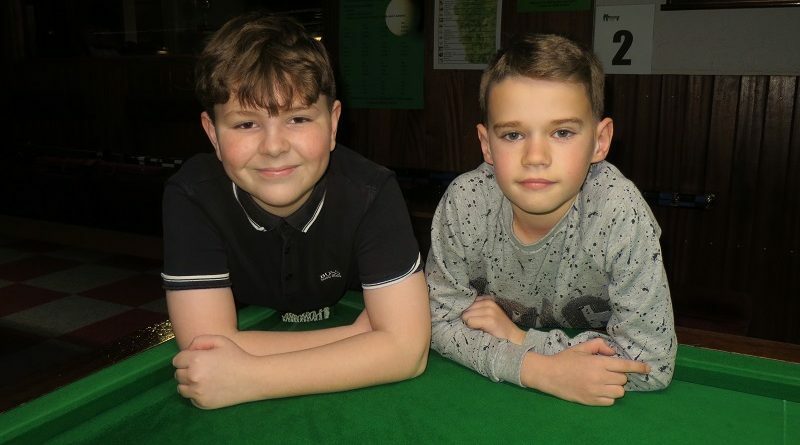 CUESTARS players Oliver Sykes and Harry Wyatt have both retained their junior league titles at Chandlers Ford Snooker Club. And they both had another reason to celebrate. Sykes, 13, topped the Under-19 Premier for the third time. Riley Ellis finished the 20-week season as runner-up. Nine-year-old Wyatt won the Under-13s for the second time. Six-year-old William Thomson was second. League 59 kicks off on Saturday. Under-13s are in action from 9-11am followed by under-19s from 11am-1pm. All sessions are run by World Snooker coach Tim Dunkley. Complete beginners are welcome. In addition, Dunkley will also be running the ten-day Easter Cup during the school holiday. Weekday sessions are 11am-3pm. Sykes followed his junior league success by recording his third competitive century. The left-hander cleared the table for a 105 in his first frame of the Open Series against Grahame Hughes. And the previous evening, Harry’s dad Chris became an official EASB referee. Chris has been working with tutor Derek Budde in Brighton and passed with flying colours.